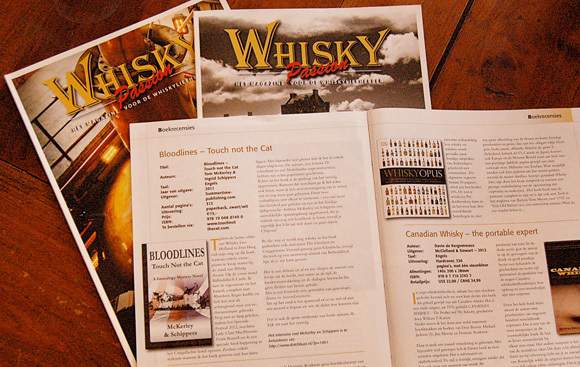 Many many thanks to Ronald Zwartepoorte, chief editor of Whisky Passion Magazine and Hans Offringa, author and media specialist who collaborated on giving us a wonderful review in the Whisky Passion edition of January 2013 and gave us very good feedback on our writings. It will make the sequel, Bloodlines-Traces, which we are in the middle of producing now, even niftier, faster and intriguing. During the last edition of the Whisky Live Holland festival in The Hague; my eye caught this book, of which a number of copies were for sale at the Whisky Passion booth. The cover showed Ballindalloch castle. I know the owner and the castle, complete with Aberdeen Angus herd, and have used it as background once for a television documentary. Recently, during the Speyside Festival 2012, Mrs Russell and I had the honor to open a culinary event at the Craiggellachie hotel. All this amounted to more than one reason for me to pick up this book. I thoroughly enjoyed reading it and did so within a few days. The authors, a Scottish IT-consultant and a Dutch Yoga teacher, have written a real page turner. The last chapters of the book include the prologue of the sequel, which I will definitely read once its published, as I’m curious to know more on what will happen next. By weaving two story-lines together, one set more than a hundred years ago and one set in present day time, McKerley and Schippers have constructed an appealing brand of suspense, that tempts you to read yet another chapter, while you feel you should actually switch of the light and go to sleep. Chapeau! Some whisky is being consumed as well in the book by the way, particularly Glenlivet and Cragganmore. Oddly enough no Glenfarclas, while that is to be found only a stone’s throw away from Ballindalloch. so do not expect it to be a literary thriller. The novel grew to be an interesting mix between genealogy, drama and murder mystery. Until the very end there is tangible suspense on whether or not a murder has been committed and on the matter of “whodunnit”. The credit for this goes to both authors. I am looking forward to the sequel.